Sometimes, having a tree for a tattoo does not satisfy the urges. There are times when the beauty of a flower tattoo may not suffice to quench the emotions. If this happens to one tattoo lover, then we think we have the solution—get a forest tattoo. 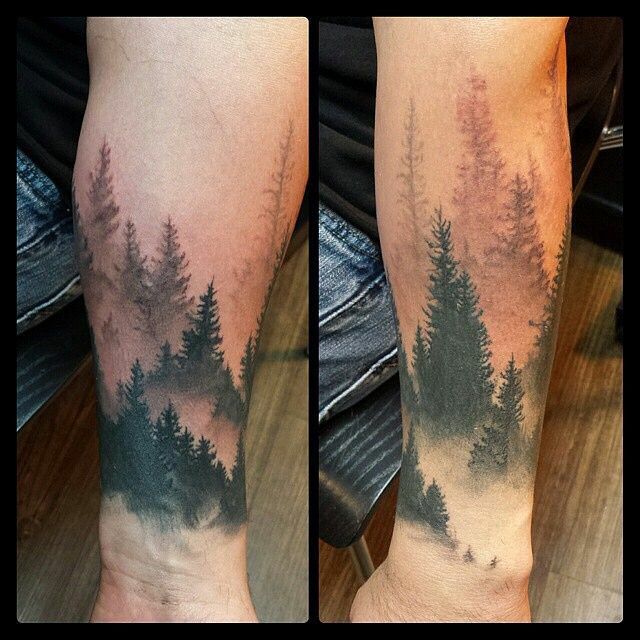 Forest tattoo is usually done in monochromatic and trees are usually in silhouettes. The canopy may be under a bright full moon or astonishing mountain ranges usually capped in snow. There are also forest tattoos that showcase streams and lakes wherein common animal folks such as deers and wolves are captured together in the magnificent snapshot. The tattoo may symbolizes serenity or complexity of life, but one thing is for sure, the bearer must be a nature lover. So whenever you feel that something’s missing to your plans of getting a rose or a pine tattoo, try to step back and see a much bigger picture. It could be that what your heart really wants is for you to have the nature itself and not just a part of it. Here are the 30 Glorious Forest Tattoo Designs for everyone!